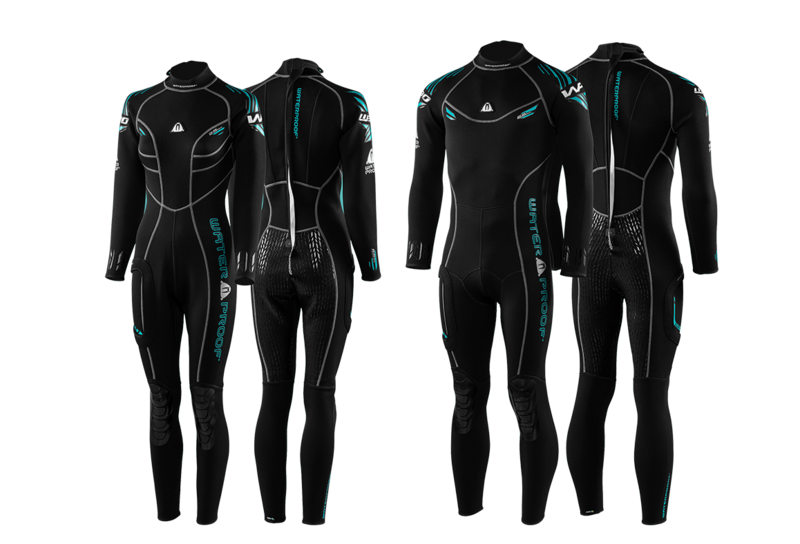 Waterproof claim that they are told their suits are too warm, hence they have developed the W30 Sport Series. The 2.5mm steamer wetsuit - it has no seals on the ankles, wrist or neck, therefore it is not a semi-dry suit - is fastened with a back zip. The ends of the sleeves, ankles and neck are finished with a piping of rolled neoprene. The high neck has been designed to reduce BCD 'rub' and pads have been fitted to the shoulders to help protect against wear and to provide 'anti-slip' properties to help keep the BCD or harness in place. The suit has also been fitted with Polyurethane reinforced knee pads. The male and female cut suits come in black with silver flatlock stitching and green accents. Apparently the W30 is a comfortable suit to dive, and an easy wetsuit to doff and don. The Waterproof Personal Accessory Deck has been designed by Waterproof to be a 'docking station'. It is located on the right hand hip and it allows the diver to add or remove a pocket. The W30 2.5mm wetsuit is part of the Sport Series collection. The collection comprises nine items that are aimed at the diver that wants to explore tropical waters.